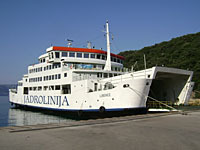 Ferry crossings from and to Dubrovnik, including fresh timetables, ticket prices and other relevant information. 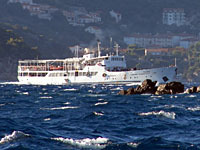 During high season, ferries and boats sail the Adriatic connecting all major ports with almost all inhabited islands in Croatia. Travelling by ferry usually takes more time, but its a way to travel completely relaxed, enjoying the surroundings. Some ferry tickets can be booked online, be sure to search the ferry connections search engine and timetables bellow. We also recommend to confirm the schedule with the respective service provider. In case you need to spend the night there are hotels near the Dubrovnik Ferry Port. 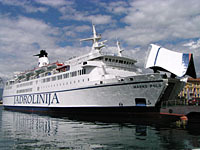 Ferry line with daily departures from Dubrovnik to Island Korčula, Island Brač, Island Hvar and Split. 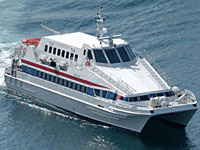 This is a Catamaran passenger ferry that connects Dubrovnik with some of Croatia's most popular islands Korčula, Hvar and Brač. Finally the ferry arrives in Split on the same day. The boat capacity is 324 passengers and cars are not allowed. During high season advance booking is recommended since this ferry departures only once every day. For 2 or more persons travelling together a cheaper and faster alternative might be to rent a car to go from Dubrovnik to Split. 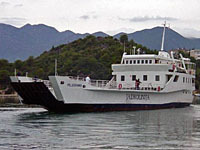 A very important ferry line connecting Island Mljet with Prapratno on Pelješac peninsula. This car and passenger ferry departs four times per day during winter, and even more frequent during summer. Prapratno is located ca. 60 km north from Dubrovnik. During summer the car line builds up fast, please check our timetable for departures. If you do not have a car there is a regular bus to Orebić, stopping at Prapratno. This car and passanger ferry line connects Ploče on the mainland with Trpanj on Pelješac peninsula. If arriving to Dubrovnik from the north and wanting to avoid crossing the Bosnia-Hercegovina border you could take this ferry. The same applies if you are traveling to, or just want to make a short stop, on Korčula Island. The journey from Ploče to Trpanj is 1 hour long.